It’s only the beginning of August, but the smell of school is already in the morning air. That crisp morning air reminds me of my own first days of school – backpack hanging over one shoulder (that’s how the cool kids wore it back then), new clothes, new shoes, and money in my pocket for a Clearly Canadian and whatever other things they sold for lunch at our school’s little snack store. A heart-shaped lunch – no instant noodles and Clearly Canadian here. This September, Ninjette will be starting at a new school because we moved over the summer. In preparation, she went to a town camp, a local gymnastics center camp, and a YMCA camp. I am hoping that someone from one of those places will be at her new school. Since we’re starting a new school, here are five tips that I wanted to share if you are starting somewhere new! Get in touch with the school over the summer and go for a visit. Most schools are still open during the summer and the administrators are usually around. It’s also a lot less intimidating to go to an empty school and helps to give a lay of the land for you and your children. We also met the principal and some of the office staff plus we got an intimate tour. It was a great time for me to ask a whole bunch of questions, too. Sign up for the summer program at the school or the town you are moving to. This takes a little planning ahead, but it’s well worth it. I wish I had known which town we were moving to in the spring because I would’ve have signed Ninjette up for the school’s summer program. However, the town had openings for the town camp and there have been numerous community events that we have been able to attend and meet other families. Go to your local library, get a library card, and participate in the events. If your town doesn’t have a town camp or doesn’t have too many community events, check out your local library. Sign up for a card and then ask about what activities they have going on – for both adults and children. It’s also a great way to meet other families, especially in the children’s section. Have a special signal, charm, or “tattoo.” I used to do this when my daughter first started preschool. I would draw a heart with a permanent marker on her hand or wherever she wanted (except her face) and then I would draw one in the same place on me. Whenever she missed me, I would tell her to look at it and I would do the same. This year, we will probably do a special charm on her new charm bracelet. It’s our personal way to stay connected through a tangible item. One of many napkin notes for Ninjette. Napkin notes in the lunch box. 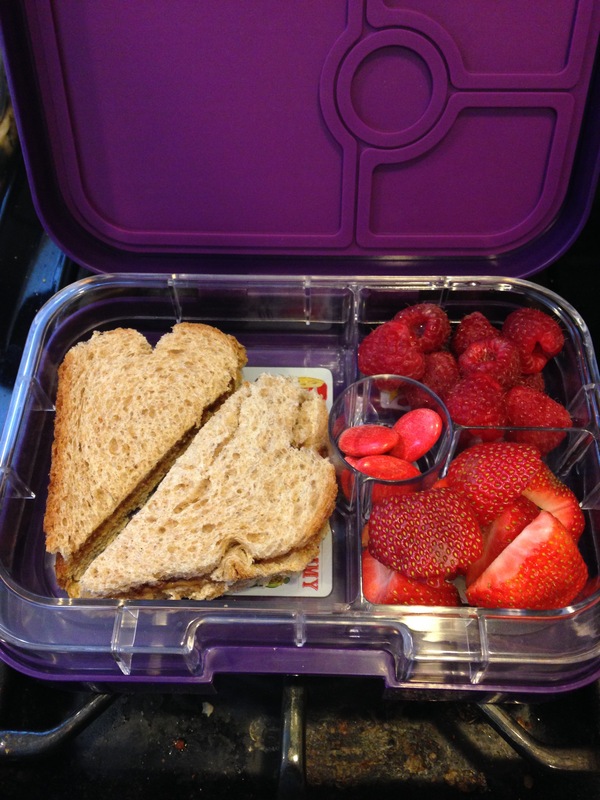 After all, I am a napkin hoarder and how could I not include some napkin notes in Ninjette’s lunch box? Last year, she couldn’t really read, so I would draw pictures and then I would show her the napkin and tell her the message. Sometimes, she would collaborate on the picture with me. I still have a collection of last year’s napkin notes in a plastic baggie. I haven’t gone back to school shopping yet, so that’s still on my to-do list. For the time being, though, we’re still enjoying the last bits of summer. School shall start soon enough! I’ll be waiting with a cookie and a glass of your favorite beverage for the first day of school! Cheers! I promise I will have a full cookie for you! Such a cute picture of N! 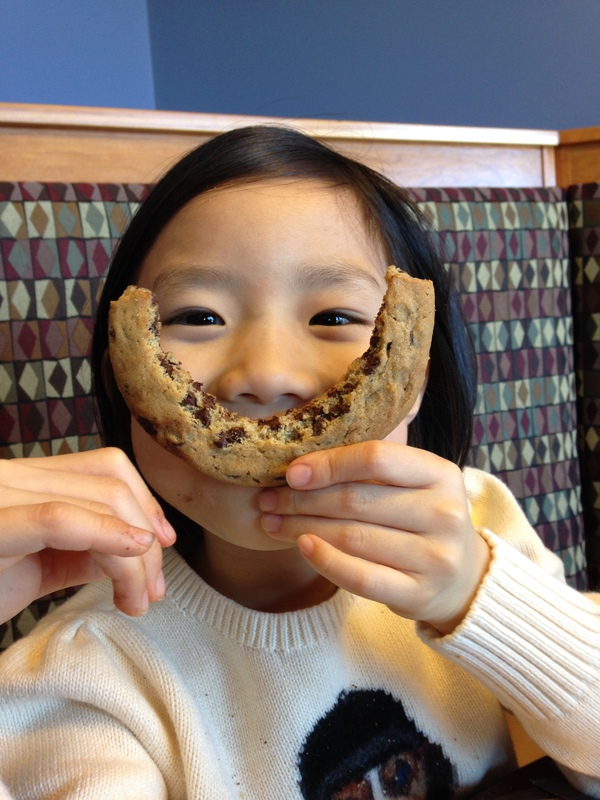 I love the photo with her and the cookie! Great idea about sending kids to camps/events during the summer so they can make friends! Thanks! It also helped me to get acquainted with the neighborhood and to meet other parents – she just had a playdate with someone this morning from camp! Love these ideas, and the darling napkin notes. That Ninjette is darling. 🙂 Thanks! I love the napkin notes, too. I should take some drawing classes! It’s even better if the tattoos are temporary! 🙂 Although, maybe Ninjette and I will get matching permanent tattoos someday. These tips are really good! A friend of mine moved to a new house in July and she did many of the things you suggested. 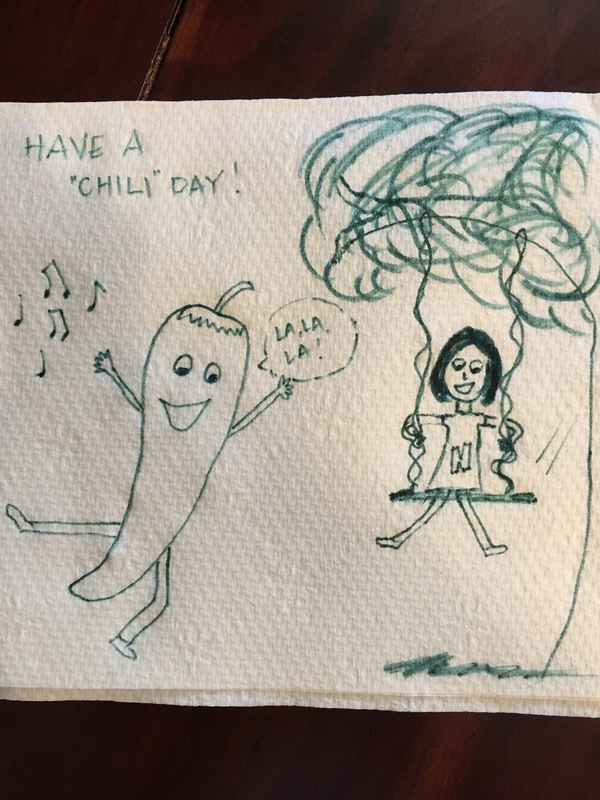 By the way, I love your napkin drawings. You are quite talented! Thanks! 🙂 I’m working on the drawings! LOL! I hope your friend has an awesome experience with the new house, new school, and new neighborhood! Oh, I really like that idea of having a special matching charm or “tattoo”! Good luck to Ninjette as she starts her new school. Thanks Bev! Ooh do you make charms? I also need to write my notes I like to have them read at breakfast on our first day. The girls still need to decide on their first day outfits, and we have our parent orientation tonight, to learn what supplies and other details for the next school year.